In an interview today, the VDV’s Chief of Staff summarized 2009 and plans for 2010 in Russia’s airborne forces. General-Lieutenant Ignatov said 90 percent of the VDV was outfitted with individual soldier radios based on the Akveduk system in 2009, and the remainder will get it in 2010. The Akveduk-5UNE is the basic UHF transceiver, and Akveduk-5UNVE and Akveduk-50UNVE are the individual radios. The VDV also took delivery of 100 modernized BMD-2, 18 Nona self-propelled artillery systems, and 600 KamAZ vehicles. It got communications vehicles including 14 R-149 KShM and 23 radio stations mounted on KamAZ high mobility vehicles. Ignatov said 80 percent of the VDV’s fall 2009 conscripts have already completed their first jump. In all, 10,000 conscripts are joining the VDV ranks from the fall draft. Another VDV spokesman said the airborne made 189,000 jumps in 2009, 29,000 more than the year before. Stepping back a bit, in mid-December, VDV commander Shamanov told NVO that the airborne received 150 combat vehicles in 2009, including modernized BMD-2 and BMD-3. He hopes to get more BMD-4M vehicles for field testing in 2010. He wants 200 of them eventually. Unlike the VVS, he emphasized that he likes domestically produced UAVs, thermal sights, and sniper rifles. Shamanov noted that 15-20 percent of the VDV’s armored vehicles might be wheeled in the future, and he plans to obtain some GAZ-2330 Tigr vehicles for recce and Spetsnaz subunits. Shamanov essentially said the VDV intends to lobby for control of helicopter units, presumably from the VVS where they’ve been since 2002, to transport and support its air assault elements. Specifically, he’s talking about the Mi-28N, Ka-52, Mi-8MTV, and Mi-26. The Ground Troops would also like to get army aviation back; perhaps both are ganging up on VVS. 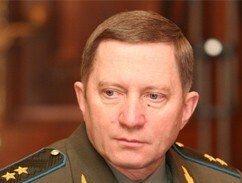 On 10 December, Shamanov called for a simple, functional approach to equipping the VDV. Unhappy with defense industries, he said he won’t buy anything that doesn’t suit the VDV. He wants better stuff than he already has in his stockpiles. As an example, he wondered when he’ll get a mine detector that works on rocky terrain. So, to some degree, Shamanov has joined the list of military leaders lambasting defense industries for poor products. This entry was posted in Air Forces, Defense Industry, Force Modernization, VDV and tagged Airborne, GOZ, Helicopters, Ignatov, Procurement, Shamanov, UAVs. Bookmark the permalink.